A new line of Gigabyte gaming laptops are on the horizon, but before they come I’ve got one more of the current generation to review. 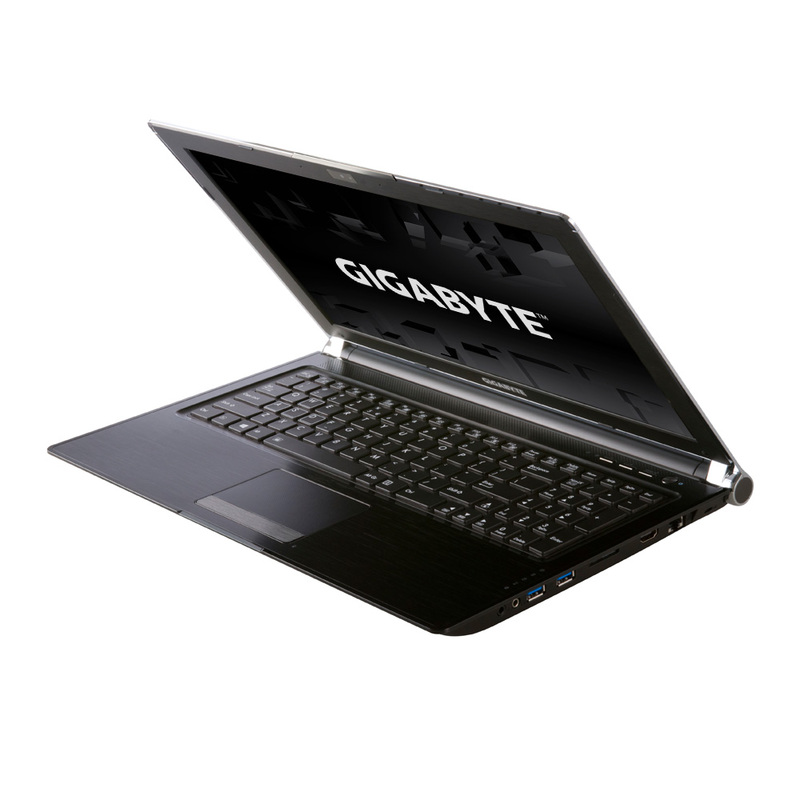 It’s the Gigabyte P25W, a 15″ machine with a powerful GeForce 770M graphics card that eclipses the 765M in the P27K and P35K. I’ve got high hopes for the P25W given the strength of the rest of the Gigabyte lineup – could this be the cream of the crop? Let’s take a look. As normal, different configurations of the P25W exist with changes to RAM, storage and optical drives. The Gigabyte P25W has a slightly different appearance than its peers, with a black brushed metal body and chrome accents around the display and lid. The stickers adorning the laptop attest to the machine’s gaming prowess, and the overall look is certainly louder than the more business-like P35K. The lid of the P25W comes in a rather brilliant yellow colour; not a shade commonly associated with gaming laptops and it’s all the better for it – at least in my taste. 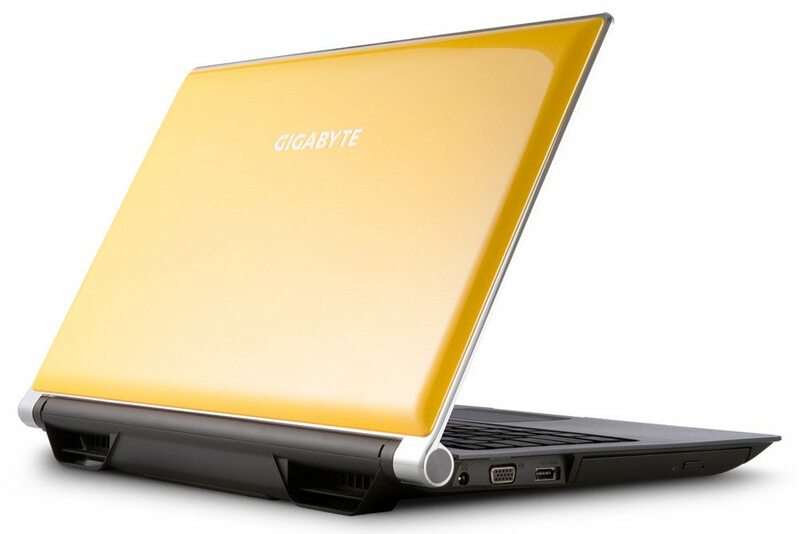 The edges of the lid are made from a chrome-like metal, as is the Gigabyte logo in the centre, which provides a slightly more ostentatious look. The bottom of the laptop is quite unusual, with a plastic superstructure providing a slanted resting position for the laptop. This serves to allow the fans to work more easily, and should help the laptop’s speakers and woofer work better too. This superstructure is affixed to the battery, so it’s possible to lower the elevation of the rear of the laptop by removing the battery – obviously, you’ll need to be plugged in for this to be useful. The main fans and air vents are also found in this area, with one on each side. One is tasked with cooling the GPU, while the other handles the CPU. The size of these exhausts makes for a convincingly powerful look from the back of the machine. Opening the lid, we can see the screen, keyboard and trackpad. The display is 15.6″ across the diagonal, with a Full HD 1920 x 1080 resolution. This is a nice fit for the Blu-ray optical drive, and makes the P25W a potent media machine. Gigabyte draw special attention to the display’s colour gamut, which is indeed respectable and boasts good viewing angles too. Again, this is good for watching videos as well as doing Photoshop work or playing games. Below the screen we have the keyboard, which is a relatively full layout. We have a full-size main cluster; a numberpad with slightly thinner (0.75x) keys; arrow keys fit between the two; and a row of slightly shorter (0.5x) function keys along the top. The keyboard is backlit, so working in the dark should be a bit easier. A function key between Ctrl and Win allows access to media controls and other helpful functions. Above the keyboard, we have a wide micro-drilled speaker grille. There are a few buttons inset in the upper right: volume up and down, ‘smart’ – which launches a quick settings app, and the power button. Tiny white indicator LEDs for number lock and caps lock exist here too. Below the keyboard is a well-sized plastic trackpad, with a mechanical left/right click button at the bottom. Multi-touch and edge gestures are supported, which is a good fit for the Windows 8 OS. To the far right of the trackpad, we have some white indicator lights for power, charging, disk activity, wireless and Bluetooth. The display and lower chassis are inundated with a wide range of stickers. We have a Full HD 1080 notice to the upper left of the display, a Made in Taiwan GIGABYTE notebook sticker to the upper right. A scorecard showing the P25W’s major hardware features – GTX 770M, “surrounding sound”, Backlit keyboard etc is in the lower right, along with a Gigabyte 2 Year warranty sticker. The bottom right is home to three stickers on a removable clear plastic panel – Intel inside, Nvidia GeForce GTX and Nvidia Optimus. If you are anything like me, then you’ll spend a good amount of time carefully removing these before use. The sides of the laptop hold its ports and optical drive. These are hidden below a fairly significantly sized lip, meaning that it’s impossible to see the ports without craning your neck around the side. Some ports – notably the USB ports – also feel somewhat loose. These factors in combination make plugging things in a challenge. On the left hand side we have DC-in, VGA, eSATA / USB and the optical drive. On the right, we have more ports: two 3.5mm stereo jacks, two USB 3.0 ports, SD card reader, HDMI and ethernet. With that, our examination of the laptop’s physical features comes to a close. Let’s move on to the testing! 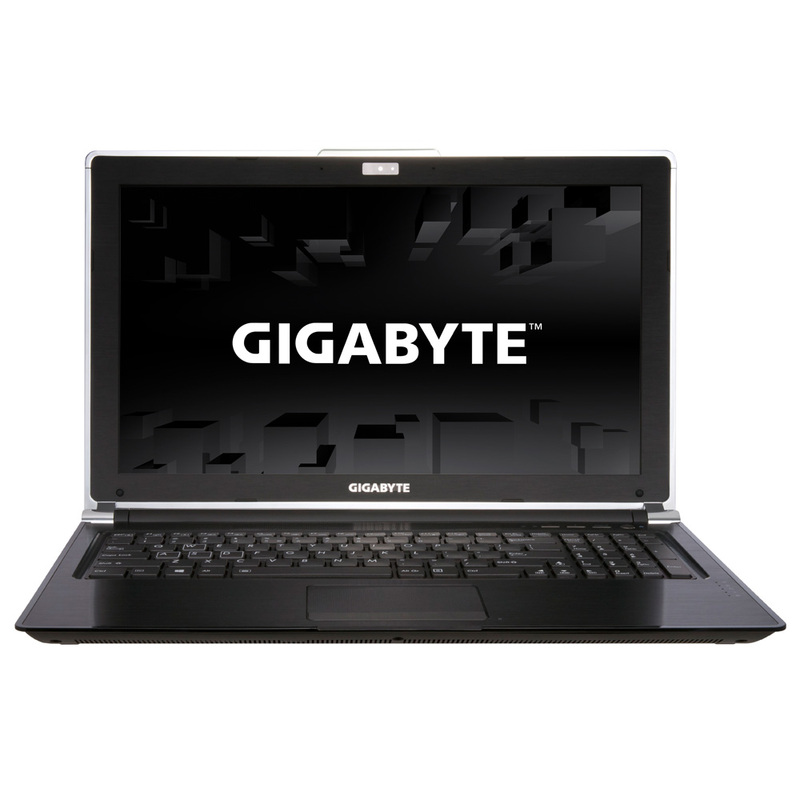 I’ll be using the Gigabyte P25W as my go-to laptop over an extended one month review period. During this time I’ll be writing, doing social media, producing graphics and playing games; I’ll be doing this on trains, in coffee shops, at the office and at home. With a trip home to Yorkshire and to Germany for WCS planned, I’ll certainly have ample opportunity to put the laptop through its paces. In addition to reporting my impressions, I’ll also be running a series of synthetic benchmarks. This should allow for easier comparisons to other laptops, at least in terms of raw numbers. Here at XSR we’re quite serious about our games, so we begin our testing with an examination of the laptop’s prowess in this field. We tried a range of games including Titanfall, Diablo III: Reaper of Souls, StarCraft II: Heart of the Swarm, World of Tanks and Bridge-It. As expected, the P25W proved a capable performer. Given a 1080p resolution, the strong single GPU provided good performance (30-60 FPS) in most games at high quality settings. StarCraft II and Diablo III in particular ran excellently, with the maximum settings and a steady frame-rate throughout. Recent shooter Titanfall proved more difficult for the laptop, but remained playable at lower detail settings. Other more challenging titles – like Battlefield 4 – required a lower resolution to maintain decent frame rates. Regardless, this is a good result for a £1000 laptop and met my expectations. If you’re willing to accept a few compromises, the P25W should be capable of playing pretty much all games for the next year or two, at least. While raw performance is important, a truly excellent gaming laptop will also operate quietly and at a relatively cool temperature. Here the P25W did not perform so well, despite its elevated design and dual rear vents for CPU and GPU. Playing through Diablo III: Reaper of Souls’ campaign proved an effective challenge for the machine, and with the highest settings the leftmost vent – belonging to the GPU – produced an impressive amount of heat. In fact, the laptop got so hot that the sound stopped working. Reboots didn’t fix the problem, but leaving the machine off overnight did do the trick. Ultimately, turning down the settings to medium/high prevented the problem from happening again. It’s possible that the machine has been over-stressed by previous reviewers, but regardless it was a disappointing result for a gaming laptop resting on a desk in a cold Yorkshire room. Overall? A strong gaming machine, once you know the machine’s limits. In this category, I’m looking to evaluate the P25W’s prowess as a media machine, primarily for displaying movies and other video files. This comes down a few major factors: the screen, the speakers and storage. As I mentioned before in the gaming section (and will mention again in the working section), the display here is quite good. While it’s a TN panel instead of an IPS one, viewing angles and colour reproduction are good enough for sharing a movie with a small audience. Laptop speakers are rarely excellent, but the P25W does its best to buck this trend. The four stereo speakers packed into the chassis do provide a louder, richer experience than many laptops, although the woofer still doesn’t provide much in the way of bass. Access to videos and music is the final piece of the puzzle. The model I was using has only a 128 GB solid state drive; with games installed there was little left over for video or music files. (Of course, configurations with additional solid state drive space and mechanical hard drives are also available). The lack of space on my review unit meant streaming or external storage was a better idea, and these needs were well catered for with the P25W. Streaming from a media server over wireless N worked well enough, and the eSATA and USB 3.0 ports meant high-speed storage was on the cards too. Overall the limited storage and lack of bass response made for a slightly weaker media experience than I was expecting, but the laptop still performed in its role well. For me, a good working laptop is one that has a great keyboard, a decent trackpad and a high quality display. In these areas, the Gigabyte P25W excels. The keyboard has sufficient key travel, providing good feedback and ensuring accidental button presses are kept to a minimum. The trackpad works without issue, although it’s not quite as nice as the glass of a MacBook. The screen is bright, accurate and of a high enough resolution. Of course, performance is a necessity as well – but as with most gaming laptops, outside of games you’ll find more than enough horsepower to keep Chrome, Evernote and Photoshop ticking over. The solid state drive minimises app launch times, the 8 GB of RAM is sufficient for as much multitasking as I care to do, and the Core i7 processor is more than a match for Skype. The one potential drawback to using a gaming laptop for work is battery life, but I found the P25W up to the task. It has a larger battery than other laptops I’ve tested, including the 17″ P27K, and this grants about five hours of battery life on Windows. Of course, doing anything more stressful like gaming will quickly run the battery dry. The only significant issue I have with the machine is the metal lip below the keyboard, which digs into my wrists terribly. This makes using the machine much less comfortable than it would be otherwise, and makes me prefer to use a USB-attached mechanical whenever possible. Another small grievance was the selection of ports; specifically the amount of USB ports. With two on the right and one combination eSATA / USB port on the left, things are a bit tight. This was compounded by a fault with my review unit, where one USB never actually worked. These small flaws aside, the P25W seems a capable office machine, with one of the best keyboards I’ve used in a long time. 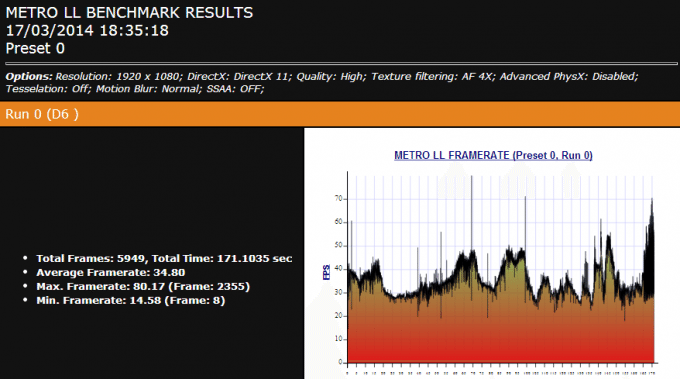 Our first benchmark is the latest version of 3DMark. This benchmark simulates a typical gaming workload, at three different levels. Ice Storm is designed for mobiles / low-end PCs, Cloud Gate is for notebooks / desktop PCs and Fire Strike is for gaming desktops. Here we got some weird results, with the P25W showing worse performance than its P27K and P35K stablemates in the first two tests. That’s against expectations because the laptops are almost identical in hardware, but the P25W has a higher-rated 770M graphics card to the 765M of the other two. In the final, hardest test though, we saw a reversal – the P25W showed a small increase in performance, as I’d expect given its marginally better hardware. Ultimately, this is the result that is important – how good performance is in challenging titles – but it’s still an oddity that I can’t fully explain, beyond the normal thermal and driver issues hand-waving. My theory is that there’s been some sort of CPU throttling (whether due to poor thermals or damage from past reviewers) going on here, and in the last test it’s mostly the GPU that’s able to show its good performance. Again, we’re seeing poor performance that is far below the purported capabilities of the laptop. I checked a few other reviews, and these reported scores in the region of 92 fps for the OpenGL portion and 660 cb. Given these, it looks like our review unit is misconfigured or otherwise damaged. CrystalDiskMark is a benchmark that examines disk read and write performance. As expected, we’re seeing almost identical performance to the P27K, which also comes with a single 128 GB solid state drive in our review configuration. There is room for a second solid state drive inside the P25W, allowing the possibility for a RAID0 solid state array. This would make for results equivalent to the X7 or P35K speeds in the table above. Again, these results are way lower than expected, given the CPU used here is identical to the one used in the P27K. Something weird going on here, sorry! With a single 770M video card, we should get performance somewhere between the dual 765M found in the Aorus X7 and the single 760M in the Gigabyte P27K. Thankfully for my sanity, that’s exactly what we do see. The average framerate is 34 fps; not a bad result given the challenging nature of the test. That sits between the 44 fps of the X7 and the 27 fps of the P27K, just as anticipated. This is a good enough result to make for a playable game, although you’d definitely see a big improvement in playability given medium settings (and potentially a lower resolution, e.g. 1280 x 720, as well). Our final benchmark is Company of Heroes 2, an excellent strategy game centred around the Eastern Front of WW2. The game includes a robust worst-case benchmark, so if the game is playable here then you’d expect much better results in actual singleplayer or multiplayer. The P25W has the unusual distinction of having the lowest minimum FPS I’ve ever seen reported in the CoH 2 benchmark – a frigid 2 fps. Thankfully though, there were also plenty of high points, and the overall score of 27 fps average is where we’d expect to see it. The 765M of the P27K, for instance, scored 23 fps, while the X7 showed a score of just 20 fps (as the game doesn’t take its second GPU into account). This was definitely a weirder benchmarking section as usual, with a lot of unexpected results that seem outside of what has been reported for this laptop by other outfits. For that reason, take these with a grain of salt. As a general rule of thumb, expect 10-20% better in-game performance than the P27K or P35K (and other similarly equipped 765M gaming laptops). The P25W is a strong all-rounder of a gaming laptop, with good performance across a wide range of activities thanks to impressive internal hardware and an excellent keyboard. There are some certainly some downsides to the laptop, including poor thermal performance and a limited port selection, but the laptop has few real weaknesses. Out of the current-generation Gigabyte lineup, the P25W is my laptop of choice.